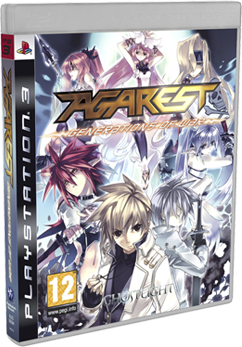 At the dawn of time, the world of Agarest was plunged into a terrible war between the forces of good and evil. Entire races fought and died for their divine masters, ending in the total destruction of Agarest. The victorious Gods of Light unified the decaying bodies of the Gods of Darkness and created a new world, sealing the Dark Gods' spirits into an eternity of darkness. Unite with your chosen heroine and use the "Soul Breed" system to shape the fate of the next generation of heroes. Network Logo is a service mark of Sony Computer Entertainment Inc. Agarest: Generations of War ©2009 COMPILE HEART / RED. Published by Ghostlight LTD. Ghostlight is a trademark of Ghostlight LTD. Developed by Idea Factory. All rights reserved.